All joking aside, I do think Frozen is a wonderful movie. Sure, it’s beautifully made and who wouldn’t love all those frosty scenes of winter wonder, but what I really like is its message. Romantic love cannot save the day. Sacrificial love comes to the rescue. I see parallels to the Gospel. We are all broken people, and just as Elsa cannot control her innately icy powers, we cannot contain our sinful natures and avoid the devastating consequences of a life apart from God. Elsa thinks that giving her powers free reign will bring her peace and happiness, but doing so only compounds the misery. But Anna loves her and is desperate to reconcile with Elsa and rescue Arendelle from its frozen curse. Like Anna relentlessly pursuing Elsa to her own peril, Jesus comes after us, holding out His love and laying down His life. It is Christ’s sacrifice that calls us to true freedom. It is His love that breaks the curse of sin in us and teaches us to love. If my daughter is going to pick a movie to adore, this one has themes I don’t mind her pondering in her young heart. 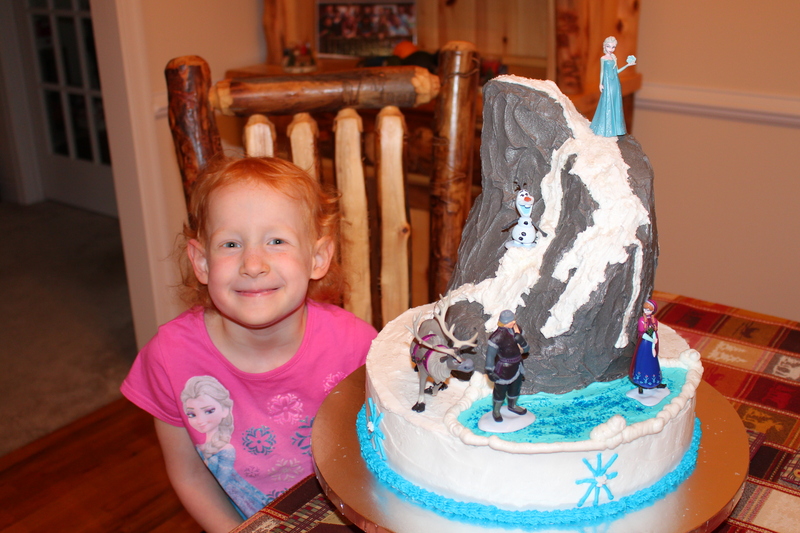 Since seeing the movie last year, my daughter has constantly reminded me that she wants a Frozen birthday party, and most importantly, she would like a Frozen cake. Now I like to cook and bake, and thanks to training from my dear mom, I can do both quite handily. My mom was so thorough that she even taught us how to make decorator cakes, and this skill has come in handy many times in life, especially since having children. However, it also comes with a certain sense of expectation and obligation on my part. Because I CAN create a cake my child will enjoy, I feel like I MUST create the most wonderful version of it my amateur skills can handle. This leads to visions of cakes that are often time-consuming and challenging to deliver. Every year, I promise myself that next year, I’ll make something simpler. The next year rolls around, and I find myself upping the ante. And the reason I put myself through this is pretty easy to figure out. While I’m not fond of the mechanics of making decorator cakes, I love the creativity of the process, starting with a nebulous idea in my head and watching it take shape in cake. My daughter’s only request was that all the major characters except Hans be on the cake. But as I contemplated exactly what type of Frozen cake to make for her, I couldn’t get the picture of that gorgeously frozen precipice, the North Mountain, out of my head. What if I could replicate that in cake–how awesome would that be?!?! So I figured Frozen being as popular as it is, I would be able to do a quick search on the Internet and find someone else who had already created the North Mountain in cake. That way, I wouldn’t have to think through the nitty-gritty of how to engineer it. Well, I did find several cake photos where someone had created their version of the North Mountain, but no one had posted details of how they did it. So game on, I knew this cake was going to be a doozy. After considerable pondering, I came up with an idea I thought would work. I baked my cakes–I needed three–and ran into my first obstacle. Two of my cakes erupted like a volcano in the oven. There was chocolate lava everywhere. In all my years of baking cakes, I have never had this happen, and given the gargantuan cleanup effort, I hope I never do again. After baking two more cakes, I finally had the building blocks for the North Mountain. But now came the sketchy part–how to take three perfectly rounded, level cakes and make them look like a steep mountain ridge. My dining room table was littered with cooled chocolate cakes. My frosting was made and ready to go. But for hours, I walked in and out of my dining room, thinking, measuring, scribbling rough sketches, and nervously glancing at my carving knife. I knew what I wanted the end result to look like, but I couldn’t completely see my way from point A (three perfectly round layers) to point B (the North Mountain). What if I made a wrong cut? I’d have to make more cake, and I was really sick of making chocolate cake by this point. What if I almost finished, and the whole mountain collapsed? Could my daughter live with North Mountain rubble? Could I? I was completely…frozen, unwilling to risk my cakes all because I couldn’t totally see my way through. I wanted to know it would absolutely work before I was willing to plunge my knife into all that chocolatey goodness. Now cake, even Frozen cake that a 5-year-old is banking on, is really NOT important. But I started thinking about how I’m like that in my faith sometimes. I’m pretty clear that God is calling me to something, but because I can’t see what it is or how to get there, I just stay still. God has been taking my husband and I through a very strange and uncomfortable season for quite a while now. I don’t think I’ve ever been so uncertain about where God wants us or what ministry He has for us. I have no idea what God is making. I want to do His will. I want to take the right steps, make the right cuts. I just have no idea what they are. I wish things weren’t so veiled. I have prayed for clarity and understanding. I have not prayed for release because if God is training us, I don’t want to cut the lesson short. But over the last few months, I have realized that while I cannot step out ahead of God’s clear direction for the big picture, I also cannot remain frozen, failing to act on His direction in the “little” things. I can minister to the teens God has graciously continued to place in our path. I can care for and encourage the few remaining friends we have in our community. I can share Christ with those God has planted in my life who don’t know Him. I can grieve with those who are suffering because we are walking in its shadow. I can love on the husband and daughters God has blessed me to have. I can hold out the hope of Christ anytime and anywhere that God gives me opportunity. I can spend sweet time with my precious Savior. I can submit to His loving discipline and mysterious sovereignty. By God’s grace and in His power, I can do all these things while still completely, utterly in the dark about His plan and where it’s taking us. I not only can do them, I must. God does not call us to a frozen faith. I stood in my dining room, looking at those cakes, and finally realized I just had to take the plunge. If I waited to cut those cakes until I could see my way clear from rounded layers to the majestic North Mountain, I’d be serving my guests unadorned chocolate cake. So I picked up the knife, and I cut and cut and cut, working my way through it one stroke at a time. Did I get everything exactly right? No. But nothing went too far off track either. And the sweetest surprise was this–cutting my first two layers and realizing that two of the wedges I removed, when turned on end, perfectly formed the silhouette of the upper ridge of the North Mountain. It’s amazing what can happen when you choose stepping out in trust over remaining frozen in fear. This entry was posted in Discipline, God's Sovereignty, Suffering/Trials and tagged discipline, Frozen, Frozen cake, sovereignty of God, suffering, trials by redeemedredhead. Bookmark the permalink. Thanks for sharing this perspective. I needed some inspiration this morning. I loved the analogies too! Thanks, Tim! Glad you enjoyed it.